Location: Robertsbridge, East Sussex, England. Notes: Bodiam Castle (/'bo?di?m/) is a 14th-century moated castle near Robertsbridge in East Sussex, England. It was built in 1385 by Sir Edward Dalyngrigge, a former knight of Edward III, with the permission of Richard II, ostensibly to defend the area against French invasion during the Hundred Years' War. Of quadrangular plan, Bodiam Castle has no keep, having its various chambers built around the outer defensive walls and inner courts. Its corners and entrance are marked by towers, and topped by crenellations. Its structure, details and situation in an artificial watery landscape indicate that display was an important aspect of the castle's design as well as defence. It was the home of the Dalyngrigge family and the centre of the manor of Bodiam. 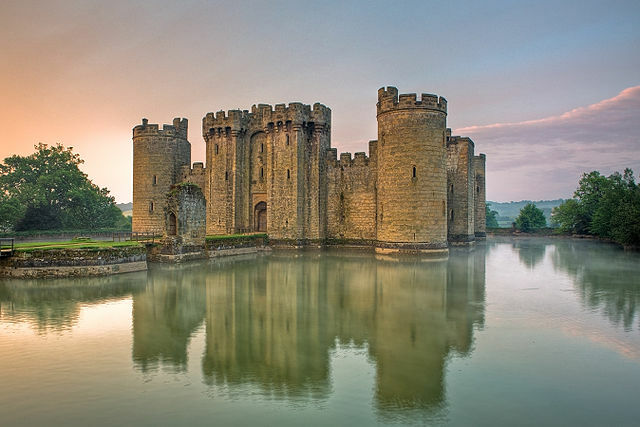 Possession of Bodiam Castle passed through several generations of Dalyngrigges, until their line became extinct, when the castle passed by marriage to the Lewknor family. During the Wars of the Roses, Sir Thomas Lewknor supported the House of Lancaster, and when Richard III of the House of York became king in 1483, a force was despatched to besiege Bodiam Castle. It is unrecorded whether the siege went ahead, but it is thought that Bodiam was surrendered without much resistance. The castle was confiscated, but returned to the Lewknors when Henry VII of the House of Lancaster became king in 1485. Descendants of the Lewknors owned the castle until at least the 16th century. By the start of the English Civil War in 1641, Bodiam Castle was in the possession of Lord Thanet. He supported the Royalist cause, and sold the castle to help pay fines levied against him by Parliament. The castle was subsequently dismantled, and was left as a picturesque ruin until its purchase by John Fuller in 1829. Under his auspices, the castle was partially restored before being sold to George Cubitt, 1st Baron Ashcombe, and later to Lord Curzon, both of whom undertook further restoration work. The castle is protected as a Grade I listed building and Scheduled Monument. It has been owned by The National Trust since 1925, donated by Lord Curzon on his death, and is open to the public.